The owners of the property at 5775 Collins Avenue (Marlborough House) asked the Design Review Board yesterday for more time to discuss their proposed project with residents of neighboring buildings, however their attorney insisted their plans are not going to change. 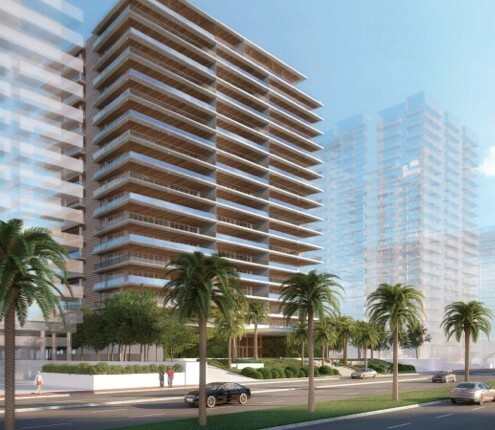 In a room with a large number of residents wearing blue shirts (to protest the blocking of ocean views), Jeffrey Bercow, representing the owners, Miami Beach Associates LLC, was met with resistance when he asked for a continuance until the July 7th meeting. “We need additional time to address some of the concerns raised by our neighbors,” he said. He said they have met with residents of Villa di Mare to the north, L’Excellence to the south, and just recently met with residents of the Royal Embassy across the street from the proposed project. Most of the people who showed up to express their opposition indicated they live at the Royal Embassy. Planning staff member James Murphy told the board he had received “quite a large number – plus or minus 60 – letters in opposition” to the project and noted that Staff recommended continuance of the discussion until the September meeting date “because of the substantial amount, in Staff’s opinion, of refinement that needs to occur.” In a memo to the Board, Staff recommended “reorienting” the building on the site to allow for more open view corridors and including a public beach access. As a matter of procedure, once an applicant requests a continuance, the only public comment allowed is restricted to the request for continuance. Cesar Buia, a resident of the Royal Embassy, acknowledged residents in his building met with the developer and their attorneys last week. “We expressed our concerns…the response I got is that the project is the project. No changes,” he said. Unless there is “a radical and drastic change” to the project including “providing a path to the beach and shifting the building 90 degrees,” he didn’t think more time would make any difference. Several other residents said a resolution could not be had in the 30 days between yesterday’s meeting and July 7th. Bercow continued to emphasize there would be no change to the plans. “We believe that we can make acceptable accommodations between now and July and we understand that if we don’t, there’s a risk that our application will either be denied or further deferred or continued to September or a later date. We understand that but we think we can do it within July and our clients’ development and construction schedule is pushing us to get this done as quickly as possible.” The last comment generated laughter from the audience. When a Board member asked if anyone had the appetite to put forth a continuance until July as requested by Bercow, no one indicated a willingness to do so. The motion passed 6-0 with applause from the audience. Phang responded, “Jeff, we’re not. We’re not saying that we are deciding this based upon what Staff’s recommendations are. We’re just saying that we think it’s too truncated an amount of time for you to make a good faith effort to meet with the people that you need to meet with…” and come back in July. The Board did not act on the request. The project will be back before the Board at its September 5th meeting. North Shore Open Space Park: One other DRB note, the remaining items needing approval in the renovation plans for North Shore Open Space Park – the fencing along Collins Avenue, playground equipment and the park lighting plan – have been continued for discussion at the September meeting after the City Commission asked for further review. The Board already gave its approval to the rest of the plan.